The Katahdin region is truly blessed with a rich variety of recreational trails. There is nearly 300 miles of hiking in Baxter State Park alone. Add to that the foot trails in the Debsconeag Wilderness area, the Katahdin Woods and Waters and the Nahmakanta Public Reserve lands – in particular the Turtle Ridge trail and the Ice Cave trail to name two popular woodland walks. And let us not leave out an assortment of other forest paths such as the Horserace Pond and Rainbow Lake Trails, and the friendly and gently rolling Katahdin Timberland trails along River Pond. And, of course, saving the most magnificent for last – The Appalachian trail: that 2200 mile footpath that wends its way from Georgia to Maine, ending or beginning (depending on if you’re a north-bound or a south-bound A.T. hiker) on the summit of Mount Katahdin. The AT does not end there – heading through the Katahdin Lake Trail in Baxter State Park and pick up the International Appalachian Trail “IAT” and head to Scotland starting off through The Katahdin Woods and Waters parkland the Regions newest contribution. All of these lumped together will wear out several pairs of boots over the course of several summers for the hiking enthusiast looking for variety and challenge. But let’s not limit the possibilities the Katahdin Region offers to foot travel. There is a longstanding tradition of mechanized travel over highly developed and meticulously maintained snowmobile trails. When the snow flies in the Katahdin region these trails come on-line, providing a broad and consistently groomed system that becomes the artery of winter travel hereabouts. Various clubs and businesses help with the grooming duties, including New England Outdoor Center (NEOC), Five Lakes Lodge and the Katahdin Timber Cruisers. Snowmobilers from all across New England and the Mid-Atlantic States spend family vacations riding these trails. With the lakes frozen and the leaves off the trees, the snow covered flanks of Mount Katahdin are never too far from view. The summer counterpart to this mechanized recreation is the new ATV path known locally as the Katahdin Region Multi-Use Trail. It is 16 miles long and links to other Maine ATV systems. years. Dedicated volunteers help maintain and groom these trails. Most recently, a trail system designed by Olympic Bi-athlete John Morton has been constructed at New England Outdoor Center on the shoulders of Black Cat Mountain and Hammond Ridge. 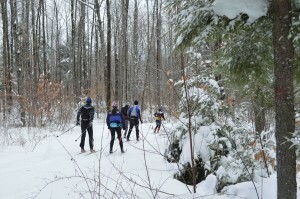 These ski trails accommodate both classic and skate technique. They have been designed to take full advantage of the thrilling climbs and descents, and have the feel about them of an exciting marathon ski course. Snowshoe trails wind in and out of the hemlocks and spruces, occasionally crossing these groomed trails. The Katahdin Woods and Waters has added over 20 kilometers of groomed trails to the region also with the new trails that are open and groomed there. Of course, area waterways – both rivers and lakes – have provided pathways for the ancient peoples of this land ever since the great ice sheet receded. That tradition is celebrated today by paddlers plying these same waters from sleek canoes and, in the most turbulent stretches of whitewater, in inflatable rafts and colorful kayaks. 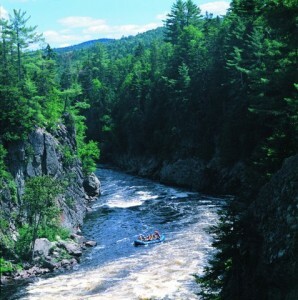 There are numerous canoeing rivers in the region – The Allagash and Saint John, and parts of the Penobscot’s West and East Branches, to name the more popular runs. There are a number of whitewater bases in the region to accommodate thrill seekers, NEOC being a leader in rafting and kayaking. With this much opportunity for recreational trail use there is yet one other element that ties all of this potential together. 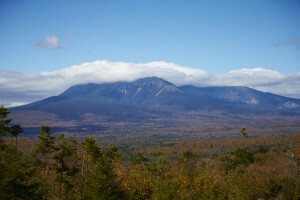 It is the rugged shoulders of Maine’s highest mountain – Katahdin. With a serrated ridge line like no other east of the Rockies, Katahdin is a mile high granite magnet that can be seen from nearly everywhere in the region. Whether you are skiing, snowmobiling, hiking or paddling, you soon realize that you are experiencing the beauty and grandeur of a unique and unrivaled landscape. It is this basic fact that causes countless people to fall in love each year with the Katahdin region.